Kayleigh is currently on her second world tour with Barrage 8, putting on an exciting production with 8 string players and a wide range of genres covered each performance. She recorded drums and percussion on their album at Escarpment Sound Studio in Ontario, Canada in December of 2015, and on their upcoming album at Florida Gulf Coast University in Fort Myers, Florida. Kayleigh also gives drum kit and percussion clinics at Middle and High schools all over the country. Recently moving into the collegiate world, Kayleigh was courtesy faculty and artist in residence at Florida Gulf Coast University in Fort Myers, Florida this Spring Semester and gave a masterclass at Nashville State in 2016. Kayleigh performs and records for artists in pop, country, rock, christian rock, latin, fusion, and jazz genres and has recorded at Ocean Way, Blackbird, RCA Studio B, Quonset Hut, Benchmark Sound, Addiction, Sound Emporium, and onstage at the Grand Ole Opry. She has also performed at the Grand Ole Opry three times with up-and-coming country artist Ashley Clark. 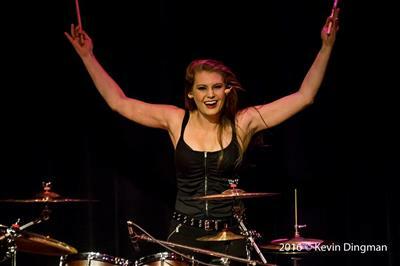 Kayleigh was a featured performer at the 2014 Nashville Drum Show. On that performance she played with her duet, The Khromatiks, playing their original arrangements featuring Kyle Pudenz on electric violin and phrase looper and her on drums. The Khromatiks have a YouTube page where they post original and cover videos to this day. Originally from Syracuse, NY, Kayleigh has a strong jazz drumming background that included her attending the competitive Skidmore Jazz Institute in the summer of 2010. She was also named the #1 high school jazz drum set player in New York State by auditioning and being selected to play in the New York Conference All-State Instrumental Jazz Ensemble her senior year of high school. Kayleigh made the move to Nashville in 2011 to study commercial music at Belmont University. She was nominated for and was awarded the Freshman of the Year Award, Sophomore of the Year, and Junior of the Year/ Presser Scholar for the School of Music by the faculty. She was also awarded the Percussive Arts Society scholarship dedicated to iconic Nashville drummer Larrie Londin. She graduated with a Bachelors in Commercial Music Percussion with an emphasis in Performance in May of 2015. Kayleigh endorses Sleishman Drums, Mothertone, Sabian Cymbals, Innovative Percussion, Humes & Berg Drum Cases, Drumtacs, Sonall Percussion, and Prentice Practice Pads.